Flagging the alleged discrimination to the North in the state Budget, a couple of organisations raised a demand for a separate state of North Karnataka last month. Three months into his term, Karnataka Chief Minister H D Kumaraswamy has faced the accusation that his is a government of South Karnataka, for South Karnataka. Flagging the alleged discrimination to the North in the state Budget, a couple of organisations raised a demand for a separate state of North Karnataka last month. BJP legislators B Sriramulu and Umesh Katti joined the clamour, before the party leadership moved in to swat away the idea and distance itself from the demand. So, is there such a thing as a North Karnataka subnationalism? And what explains the divide, if any, between South and North Karnataka? In 1954, at the height of the debate over the unification of Karnataka, Mysore Chief Minister Kengal Hanumanthaiah set up a committee to survey the Kannada-speaking areas scattered across the Bombay Presidency, Hyderabad, and Coorg. Its task was to assess the levels of development in these areas with respect to education, irrigation, and industrialisation. As historian Janaki Nair narrates in her book Mysore Modern: Rethinking the Region under Princely Rule (2011), the committee returned a stark assessment: though united by language, a large chunk of these areas were decades behind the State of Mysore. Under the rule of the Wodeyar king and his dewans, Mysore had achieved many impressive feats. In 1806, it was perhaps the first state to take up vaccination against smallpox. According to the first Human Development Report prepared by the government of Karnataka in 1999, the first two birth control clinics in the world were set up by the government of Mysore in 1930. Its emphasis on education and health, and its aid to industries laid the foundations for the state’s many public sector institutions. Agriculture boomed thanks to its big dam projects. Mysore became the first state to use electric power to light up a city (Bengaluru). In contrast, the area under the Nizam — which is now known as Hyderabad-Karnataka — remained a feudal and desperately poor place. Bombay-Karnataka, where the demand for a united Kannada-speaking state first emerged in the 20th century, also lagged behind. Both these areas felt alienated from the political regimes that ruled them; unification was a way to seek a new, fairer deal. But for Mysore, the calculation was different: would this “model state” not be dragged down by embracing the backward regions to its north? Many leaders of Mysore, including Sir M Visvesvaraya, architect of the modern princely state, shared this fear, and were opposed to adding on political units. There was also the question of caste — the Vokkaligas, who were concentrated in the South, feared that a united state would give Lingayats, their rival dominant caste in the northern regions, unprecedented political power. Nevertheless, Hanumanthaiah, also a Vokkaliga, argued that a bigger state would bring about greater and varied development. In 1956, the newly unified state, called Mysore, was formed. It was renamed Karnataka in 1973. The first demand for a separate state of North Karnataka was made in 2000. Why would the people of the region want to reverse something they had fought for? The reality is that in the decades since 1956, the arid and drought-prone regions of Hyderabad-Karnataka (comprising the districts of Bidar, Gulbarga, Yadgir, Raichur, Koppal and Bellary) and Bombay-Karnataka (Bijapur, Hubli-Dharwad, Belagavi, Gadag and Bagalkote districts) have not kept pace with the South. Hyderabad-Karnataka, especially, has areas with alarmingly low HDI indicators, resulting in stunting and malnourishment in children. “These are also areas characterised by great inequality. They haven’t been able to pull up every section of the society,” economist Narendra Pani said. In 2000, Chief Minister S M Krishna’s Congress government formed a high-powered committee headed by economist D M Nanjundappa to look into the regional imbalance in the state. The committee confirmed that the northern regions were some of the most backward, and recommended spending Rs 2,000 crore on their development every year, for eight years. In 2012, the UPA government awarded special status to Hyderabad-Karnataka under Article 371J, allocating more funds to the region, and reservation in jobs and education to its residents. 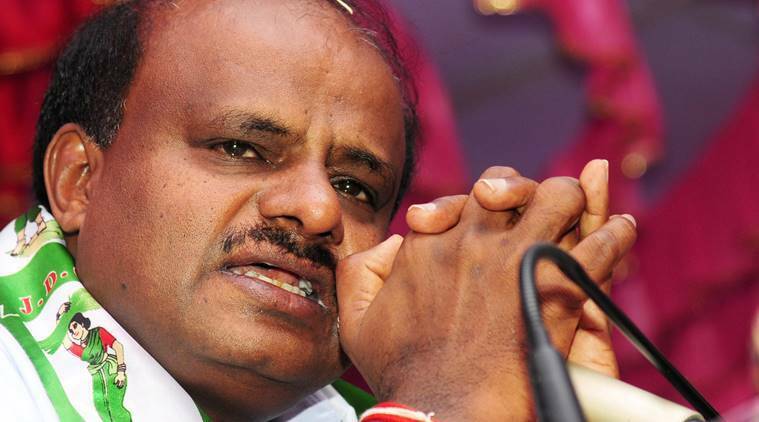 Ever since the Kumaraswamy government took oath, there have been rumblings that a Vokkaliga Chief Minister would not do justice to the North. Some of the criticism has come from Lingayat leaders in the Congress, who have found themselves out of the Ministry. Certain statements by Kumaraswamy have not helped either. On the BJP side, former Chief Minister Jagadish Shettar, while saying that his party is against a separate state, has emphasised that “the neglect of the northern regions will be an issue in the coming Lok Sabha election”. On the ground, in fact, there is no fire of separatism to fan. The statehood demand has few takers among writers, intellectuals and artists of North Karnataka — as well as farmer leaders. Karnataka Pradesh Congress president Dinesh Gundu Rao has said that the BJP “tried but failed to polarise people”. The Congress, he has said, is “the only party that is present across the state, and we do not discriminate against any region”. By stirring the pot, the BJP hopes to cash in on the old Lingayat resentment, and prevent Kumaraswamy from positioning himself as a pan-Karnataka leader. “The BJP is worried that the farm loan waiver is making him popular beyond Old Mysore,” said N H Konareddi, the former JD(S) MLA from Navalgund in Dharwad district. How this divide, as old as Karnataka, plays out electorally remains to be seen.